The Missionary Ridge rockfall is on the move. In the past couple of days, several thousand tons of mud and debris have come down the mountainside to the Animas Valley floor, said Butch Knowlton, director of La Plata County’s Office of Emergency Management. As a result, up to 10 feet of mud, silt and rock have buried East Animas Road (County Road 250), which has been closed since Friday. Three cars have tried to drive around the barricade on East Animas Road but immediately become stuck, he said. Five to 10 homes sit below the rockfall area, but none were in immediate danger as of Tuesday. On July 5, 1998, a massive rockfall carrying boulders the size of houses came tearing down Missionary Ridge. According to The Durango Herald archives, an estimated 50,000 cubic meters of rock broke away from the cliff, falling 600 feet and cutting a swath 200-feet wide. 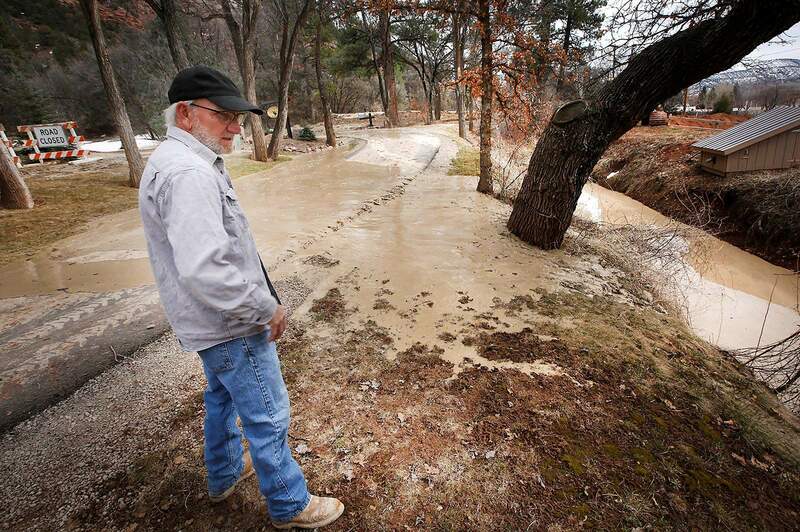 Charlie Brown, a resident on East Animas Road (County Road 250), looks at the debris flow from the Missionary Ridge rockslide Tuesday as it comes across a driveway and into an irrigation ditch. The debris flow, made of mud, rocks and trees, is about 10-feet deep where it crosses East Animas Road, which has been closed since Friday night. “I left home on Friday and drove through a little bit of debris on the road and it wasn’t a problem,” Brown said. The scar remains a prominent landmark on the eastern side of the Animas Valley north of Durango. The bulk of debris settled in the upper part of the hillside, and didn’t come close to any homes. Around 2005, however, mudslides started oozing down the hillside, frequently closing East Animas Road, sometimes for days and weeks. The debris pile is triggered in two ways: either by a sudden, heavy downpour that quickly carries rock and mud in a sort of flash flood, or through the slow process of snowmelt, which gets into rock formations and breaks apart weak layers, carrying larger debris with it. It’s this latter process that is responsible for this week’s debris flow, which causes the mud to flow like lava, Knowlton said. The consistent, heavy snowfall that hit Southwest Colorado this winter is slowly starting to melt as temperatures rise. Saturday night, several thousand tons of rock and mud came down the hillside, though it did not reach the road, Knowlton said. Thousands of tons of rock and mud flow across East Animas Road (County Road 250) on Tuesday driven by snowmelt on the Missionary Ridge rockslide north of Durango. East Animas Road has been closed since Friday because of the debris flow. 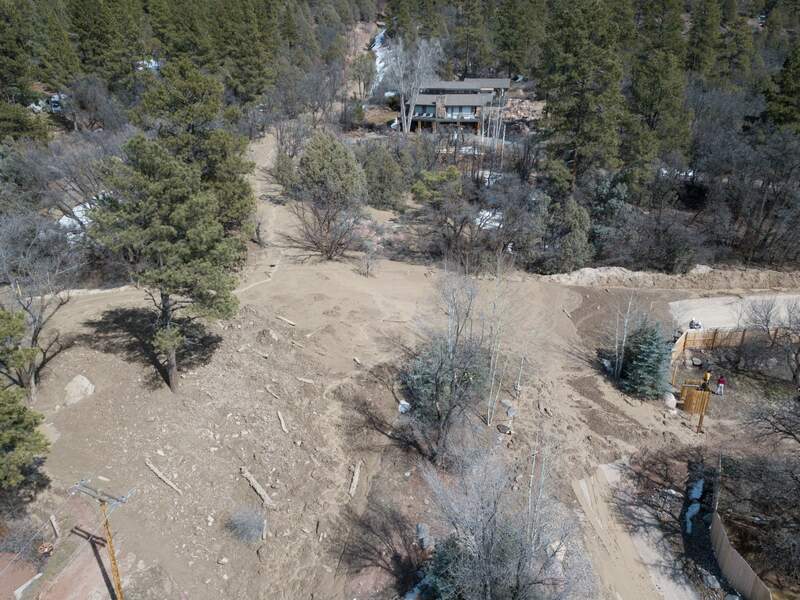 Homeowners below the rockfall have built a diversion ditch to guide mudslides to the Animas River. But the most recent runoff has filled the ditch, causing it to overflow. “Debris is moving into areas we haven’t seen it in recent years,” Knowlton said. 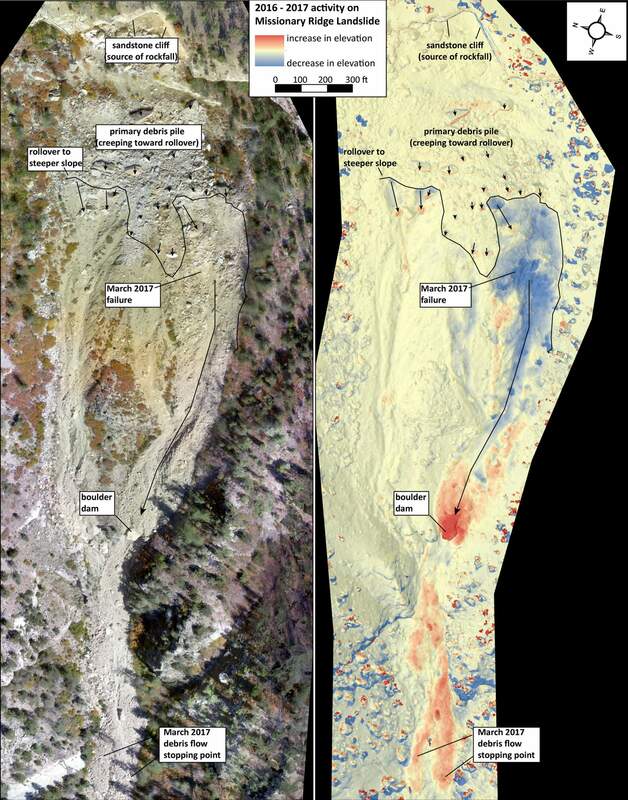 Jon Harvey, a geology professor at Fort Lewis College, has been using innovative technology with a drone to create 3D maps that track how the debris pile has moved since October 2016. A map created by a Fort Lewis College class shows how rockfall is moving down Missionary Ridge. The blue shows where the rock pile used to be, and the red shows where the rock pile is moving to after rain events. The project surveys the conditions every six months in fall and spring to document movement that occurred during snowmelt in the winter and monsoons in the summer. During the drought-stricken winter of 2017-18, Harvey recorded virtually no movement. But heavy rains in July 2018 brought down a fair amount of material, which closed the road for a time. This year, Harvey expects a lot of activity. “And if we get wet spring storms on top of the snow still up there, that’s about the worst-case scenario,” he said. About 3 feet of snow remains at the top of Missionary Ridge, Knowlton said, and with temperatures expected to remain in the mid-60s this week, more mudslides could be on the way. The National Weather Service is not calling for rain until at least Saturday night. 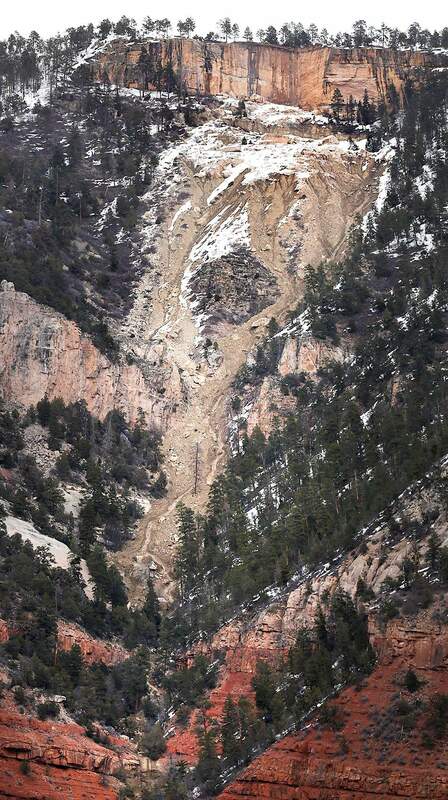 Snow melts on the Missionary Ridge rockslide Tuesday on the east side of the Animas Valley. Melting snow has moved thousands of tons of debris from the slide area onto East Animas Road (County Road 250), which is closed indefinitely. Knowlton said the rockfall is most active at night, after the afternoon sun beats down on the west-facing hillside. Residents who live near the rockslide, including Knowlton, can hear the boulders as they trudge down the mountainside. Tom McNamara, La Plata County emergency management coordinator, said it is far more difficult to try to clear the road when the mudslide is wet. It’s like moving concrete, he said. Missionary Ridge rockslide Thousands of tons of rock, mud and trees came down crossing East Animas Road (County Road 250) as a result of snowmelt at the rockfall area on Missionary Ridge north of Durango. The mudslide is up to 10 feet deep in the 2700 block of East Animas Road, which has been closed since Friday. This is one of three cars that tried to go around a blockade on East Animas Road (County Road 250) and got stuck in a mudslide.